Speaking of Fancy Pants, we got word today that our FP boxes shipped last Thursday - yay, I can't wait! Let the mailman stalking begin! Hope everyone is having a wonderful week and that whichever holiday you celebrate (Passover/Easter), you had a great one!! YAY! So we get more "Staci time"? Can't wait! I LOVE seeing all your crafty eye candy but I also love the stories...they are THE best way to get to know you better. Loved the candy story. :) There is a bit of imparted wisdom in this story...sometimes the best things come to those who lose??? lol! Can't wait to see what you do with that new box of Fancy Pants good-stuff!!! LOL!!! FUnny story Staci, glad to hear that you will be posting more...as you know I love to hang out here when you give us something to drool over!!!! Love this layout cute cute cute!!! I can picture your story exactly, Staci - it sounds like something that would happen around here! ;) And I know just what you mean about the random blogging - I feel the same way. 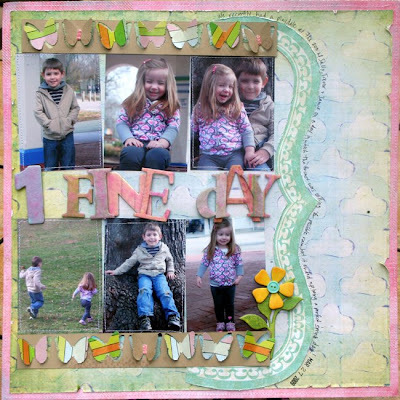 Love the little butterfly border you created on your layout! So cute! Have fun with your new goodies! I am eager to see what is coming next from FP! Love love love the layout! :-) You always do beautiful work. Thanks for stopping by my blog. I agree with Staci, yay we get more Staci Time!!!! Love the story about Noah and his winning!!! How cute!!! Did you have a camera with you? :) Love the LO and the butterflies are gorgeous!!!! I can't wait to see the rest. Did you get your row boat out yet, we are floating away!!!!! happy Wednesday! Adorable layout! The kiddos are getting so big! Chloes hair is getting so long and pretty! Hope you have a great week! I want to come to your house and stalk the mailman for the FP box too! and yay for more blogging from you! start now! heeheehee! He just wanted candy! That is such a cute story! Love your layout lady! And more blogging? WooHoo!!! Such a cute page!! 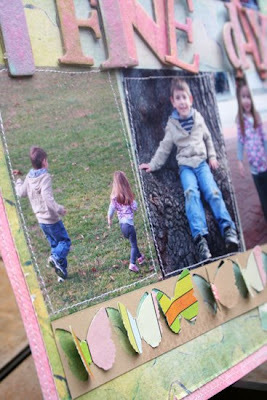 I love how you did the butterflies and that stitching around the photos looks fantastic! I enjoyed the story of Noah. I for one am applauding the fact that you're going to share more of those stories with us, it's fun! I hear ya on the blog posts as I am the same, I tend to only post when I have something crafty to share as well. I love those butterflies! So creative! Fantastic layout!!! I especially love the butterflies and those letters - did they come that way? Love it!!!! that is so funny...gotta love kids! i love that pg. 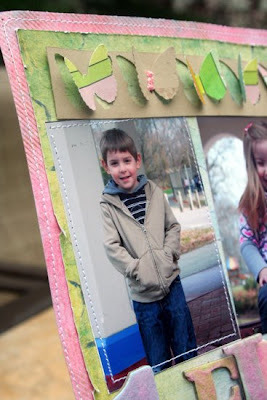 those butterflies are so adorable and great pics of the kids! LOVE love your layout - those butterflies are so darn cute - box came -its fab - can't wait till you get yours! Cute story, Staci! Kids always keep you on your toes, don't they? I've always disliked that particular game machine. I notice how usually, the arm will drop on an animal, but not lock on it. Seems rigged to me. So congrats to Noah for actually getting something. and your page is super cute. I love the stitching around the photos, and the butterflies are awesome. Love that you used the negative punched strip behind them.